Earlier this fall, we went to MOD Pizza right on St. Charles Road in Elmhurst as it was the first of the 'fast' pizza places that had opened around here. I posted about the experience here on the blog. I really liked it and would recommend trying both the pizzas and the salads. Right across the street - and I mean *RIGHT.ACROSS.THE.STREET* is another of the pizza joints called Pie Five Pizza Co. 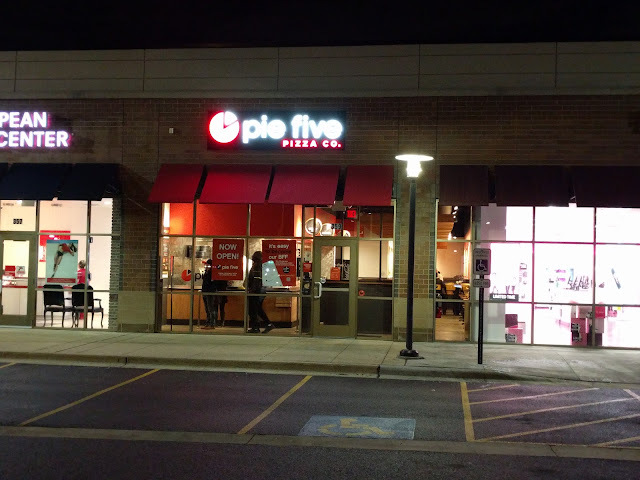 Earlier this week, after a bit of Christmas shopping, we took the kids to try Pie Five. The girls ordered kids pizzas (one had pepperoni and the other had bacon), while Nat had one of their pre-made combos (a Tuscan-something with sun-dried tomatoes) and I created my own (sausage/pepperoni/peppers). I also ordered a salad. But, unlike MOD Pizza, the salad selections are pre-made. Meaning, you get either a garden salad (with pre-set ingredients) or an Italian (with pre-set ingredients) or a Caesar (with the normal Caesar stuff). The place is HUGE. Like 40 tables huge. When we got there, we were the only ones in the whole place, but soon a few other families trickled in. They had a lot of staff working, so I have to assume that it was an oddity to have such a slow night. As for the pizza? It was fine. Certainly not great. Not close to great. The salad? Again...fine. Nothing amazing. They did have one of those super fancy Coke machines with a touch screen, so I was able to get a Fanta Zero with Peach - which was nice - but unlike MOD Pizza across the street, they don't have a liquor license, so there's no beers here. If we're in the mood for "Chipotle-style Pizza", we won't be going back to Pie Five. We'll be sticking with MOD Pizza on (appropriately?!?) the South Side.